I was one of those kids that had a new hobby every couple of months. Somewhere around 12-14 I was way into yo-yos. I bought most of the ones I could find locally, which was basically just the Yomega Fireball and others like it. In fact I remember it was a huge deal with the local hobby shop got the VIPER, which cost an absurd $45. I just had to have one and – as expected – it ruled. There was an episode of Matt Haughey’s great podcast Hobby Horse with Jeff Atwood, talking about Jeff’s obsession with yo-yos. He talked about how yo-yos are now cheap, abundant, and largely very good. 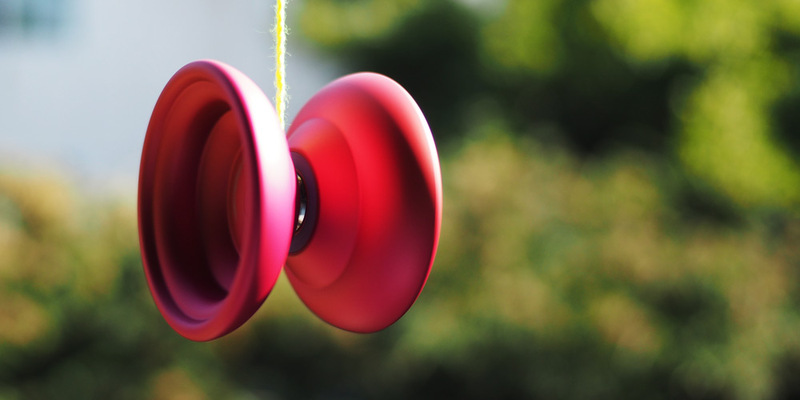 The thing that got me interested again was the discussion of a different kind of yo-yo I did not know existed – unresponsive yo-yos. Unresponsive yo-yos have a wider gap and bearing, which allows them to not return from sleep while being jerked around. This is handy for doing all sorts of crazy tricks. Then when you’re done flailing around, you do a specific type of bind to get the yo-yo to return to your hand. Seemingly by accident I have now amassed 13 14 yo-yos. Another aspect of this that I did not expect was the incredible amount of trick tutorials and yo-yo information out there. From YouTube channels to an extremely dedicated subreddit, there is no shortage of interesting (and supportive) people out there doing cool things with yo-yos. YoyoFactory Replay & Replay Pro I like the weight & feel of the Replay. Nice and big; pretty comfortable. This is the yo-yo I buy for people when I think they should try them out. YoYoFactory DV888 My favorite responsive metal yoyo so far. Smaller than you’d expect, but feels great. I kind of want to get another one in this color way. Caribou Lodge Dune Kind of ridiculous how expensive this one is, but it feels so nice. This is the first “fancy” yo-yo I bought and I do not regret it. One thing I’ve learned is that in Canada someone has the copyright to “yo-yo” so they call them “return tops”. Super weird. Recess FIRST BASE This is a perfect starter yo-yo that comes with a size C bearing to convert it to unresponsive. I’ve been pleasantly surprised how great this yo-yo feels, even for being $20.